We heard the back door open and the sound of my mother’s high heels on the kitchen floor above us. My brother’s freckles turned blood red. “Take it easy,” I told him, easing the rifle back behind the loose board. I walked up the basement stairs, my brother trailing me. My mother stood in the kitchen, hands on her hips. She had just come back from the hairdresser’s on the mainland and her hair was puffed up on the back and sides, but teased down into bangs over her forehead. “I think I must be going insane,” she said. “Because of your haircut?” my brother asked. “Did you hear that the Tigers had to move the series?” I asked her. “That’s a good question,” I said. I sat back against the old crabapple tree, in the jagged puff of shade it provided, and listened to my brother throwing up behind the garage. He came back pasty white and sweating hard. “I can’t take any more of this,” he said. “You’ll take it and you’ll like it,” I told him. It was just a line from an old movie, but he began to cry. Gradually he quieted down. We were both taking a few breaths, trying to relax, when a massive freighter nosed around the corner, about 200 feet away from us, its towering dark hull blocking out the July sun. The reason they could get up that close to the island was the deep dredging in the shipping canal, but I never got used to it. Imagine a ship passing along the next street over from where you live, higher than the houses. It was like sitting on a cliff and having a dirigible float slowly by at eye level, acting as if it was a part of your world and you were a part of its. This particular ship, so close we could see the blisters on its black hide and smell its diesely emanations, cruised away, engines grumbling, heading for the forest of smokestacks at the other end of the island. It was into this forest that my father disappeared every day, like a woodsman in a fairy tale. “Let’s mosey,” I told my brother. There was a dirt path along the eastern edge of the island where the river slapped the sides of a rusting steel breakwater filled with stones the size of petrified dinosaur eggs. About half a mile across the water was Canada, which was supposed to be a country pretty much like ours, but which you could tell just by looking was deeply, powerfully foreign. The houses were smaller, the land flatter, and the blue of the sky paler and less busy with airplanes. The clouds that flung themselves across their skies dissipated into wisps and whorls, while ours hung over us in ponderous cloudbanks. Canada was a place where everything emptied out and stopped. As I stared at it, a couple of pleasure craft, as my father called them, went speeding by, tossing up plumed water in their wakes. The people on board waved—they always waved, the same people who wouldn’t have looked twice at us if we were lying on the pavement bleeding from the mouth. In about five minutes we reached the chain-link fence that encircled the blast furnaces. Behind a casually cruel and thorny bush a flap of the fence was cut neatly open, by human hands. I liked to believe that these were the hands of the boy who had lived in the house we currently lived in, who had been carried away by the river currents and found plastered against an old pier sticking out from Mud Island, his face crumbling like moldy cheese. I eased through the fence and then waited for my brother. Even though he was smaller than me he never managed to get through without getting hung up, and this time was no exception—I had to pull his shirt away from the barbs on the fence, and I guess I did it a little too hard because a big tear opened up down the back. “No,” my brother said. He started gagging and then threw up again. In truth, I hadn’t decided yet quite what we were doing. Finding the rifle did seem like a sign, though. It was a .22 with a five shot clip and little curlicues carved into the stock by hand. The shapes were mysterious; they could have been idle doodles or messages in a strange language. The boy who died had been my age—meaning he was 12 last summer when he drowned. I couldn’t remember his name but I sometimes woke up at dawn, dreaming about him. The only halfway peaceful time on Zug was the early shift changeover, at six in the morning, when the furnaces shut down for maintenance and the electric humming that ran underneath the island abated, and that was when, in my dream, the boy came out and sat on his haunches on one of the dinosaur eggs in the breakwater, staring over the river. He wore faded brown shorts, a torn white t-shirt, and he sat there very still, like an Indian, watching the sun rise, although the sun didn’t rise from the sky but directly out of the water, its orange-white rays shining up for him. There was some special romance and poignancy to him being drowned—that last gasping struggle before giving up in the water’s embrace and floating down the filthy river among the freighters and pleasure craft, rolling, face up to the sky, face down to the depths, an offering between the two great nations. But then he did end up on Mud Island; I wish he had missed it and just sailed out into Erie, kept right on traveling. My brother was still bent over throwing up—dry heaves only now—and I rubbed his back through the hole in his t-shirt. I started walking down the path towards the center of the blast complex and soon he caught up with me and I put my arm around him. Men poured from the grimy doors of the blast furnaces wearing overalls or grey asbestos jumpsuits. Some that had lunchboxes already went and sat at the grid of splintered wooden picnic tables at the center of the dirt square. The rest lined up at the lunch wagon, which was a little truck with a boxy metal back end made out of some silvery material that looked like knight’s armor. It was actually a tiny kitchen with a rectangular window on the side that Big Mamoo propped open when she was ready to serve. The men standing in line recognized us as the sons of the plant manager, which meant that they didn’t talk to us. They were mostly black guys with a few white guys mixed in. To me they were interchangeable, stolid and dirty. We got in line and waited. Above us the smokestacks of the blast furnaces leaned in and sagging fire escapes zigzagged up and down the sides of the factory buildings. The men in line shouted at each other because it was impossible to hear anything spoken in a normal tone of voice because of the clanking of all the machinery and the sudden blasts of the furnaces and the deep wailing hum that the island threw off, which was attributable to nothing in particular, to no special manufacturing process, but simply to the awful and horrible amalgamation of sound. The hum irritated the people in Canada, who in the evening gathered on the shore across the river and stared at the island, like birders, with binoculars. The lunch wagon window opened and the line moved forward. Big Mamoo was in there, slinging hash. She was a fat black woman with jowls, wearing a white uniform with deep sweat stains under the armpits and a hairnet. She had a blackened grill in front of her for hot dogs and burgers, a little oven she used to warm up cans of Hormel’s chili and Vienna sausages, a cooler at her knees filled with cold pop, and a display of candy bars and gum over by the register. When we got to the window Big Mamoo scooped a couple of hot dogs into a buns and shoved them at us. She treated us like we were the spoiled sons of white privilege, baby snakes that would grow into fanged serpents. My father told us that someone in Big Mamoo’s family—probably her father, I think—had been thrown off the Belle Isle Bridge during the 1943 riots. I didn’t understand how she could see those of us who lived on this island and endured the flames and smoke and choking air like trapped stinking animals as somehow better off than her, but I admired her in a distant way for the purity of her anger. Taking our dogs, we walked over to where our father sat at a picnic table by himself, smoking and staring off into space. He never ate lunch, just Coke and Lucky Strikes. He had slicked-back 1920s-matinee idol hair that glistened like the green-black skin of an avocado and a thin little moustache left over from his Army Air Force days. “She’s drinking again,” I said. My father nodded and sculpted his cigarette ash against the edge of the picnic table. “Your mother marches to the beat of her own drummer,” he replied. At this point, a tall, cadaverous man with a severe flattop crewcut, hollowed cheeks and horn-rim glasses sat down next to my father and unwrapped his sandwich without a word. This was Mr. French, the father of the boy who had drowned. “Hello, John,” my father said. Mr. French nodded, his mouth full of sandwich. Although he had preceded my father as plant manager, he was now one of the cleaning crew and wore blue overalls that smelled like Borax. My father had told us that Mr. French never sat down next to him unless we were there. “He likes to see you kids,” my father said. Mr. French’s opened his mouth, then closed it. He smiled, bobbing his head several times, then got up and left the table. “In the crazy bin,” my brother said. “The loony bin,” I corrected him. We walked back home, but along the western shore this time. The western water was a mere canal, dug when the original Zug carved the island away from the land. Behind us were black hills of raw coal and coke. Across from us was more America, a stone’s throw away. To the north was the city, where smoke rose above the tall buildings. “Did you hear that?” I said to my brother. The machine gun sounded like a large animal trying to clear something from its throat. I looked across the canal. The opposite bank was notable for no one there. Usually people lined the shores to look at Zug, in weather like this sitting on their car hoods and drinking beer and throwing the empties in the canal. This was especially at night, when the orange flames from the blast furnaces billowed up into the sky, twisted like fiery rope. People in this city liked to look at flame and roar—they did the same thing over at the Rouge complex where my father worked before. But now no one was there. The streets across from the island, with their little dirty white houses, were empty in the hot afternoon. For the first time in my life, I had a sense of the emptiness of things, the old retirees and the young guys in their spaghetti strap t-shirts, not being there. Something had happened and they were not there. Some explosion beyond all of us. I looked north and west towards the riots, trying to decide how to feel, but I couldn’t stand still for long because standing still made the noise worse and so we kept on moving, around the stinking canal, past where it bent, past the houses, past the gas works in the distance, more smokestacks and tall, chain-link fences. My brother stopped when I stopped, started when I started. He had sharp blue eyes, mostly cast downward. Feral things lived on the island, damaged cats and skunks and foxes, and he sometimes found the faint impressions of their tracks. While he scoured the ground, I looked up. The sky was bright and high and almost white in the heat. There were, as always, plenty of seagulls, big lake-going ones with bills stained black that swooped in low and hovered weightlessly above the black hills. We approached the house from the rear, up the long asphalt driveway that was slick and sweating in the heat. My mother’s Comet was out back, chunky and filthy, as every surface on the island was filthy, covered with black dust. The front passenger door was open and she sat in there slumped over with her forehead resting on the dash. A pint lay on the floorboards beneath her dangling right arm. She loved to come out to the car to drink and always drank on the passenger side, as if she thought someone might at any moment come to drive her to that place where she had always wanted to be, wherever that was. My brother didn’t say anything, kept his eyes to the ground. I put my arm around his rigid shoulder as we passed her by. The plant manager’s house was the only one on the island, a dark green split-level, maybe twenty years old, with three bedrooms, a bath and a half. You walked in and the kitchen was on your right and the sunken living room to your left. We entered and went into the kitchen, which was different shades of green, avocado tiles, lime walls, then an almost yellow-green colored sink. My mother’s purse was still on the table. “No, that’s over,” my brother said. I made him the sandwich, poured him a glass of milk, and left him there munching slowly as I went down the stairs to the basement. The way the story went, she had chased him with the rifle, shooting, as he ducked in and out of bushes, fleeing her, and then he dove into the river and as the current swept him out he must have thought he had gotten away clean, but then she stood on the breakwater and aimed carefully and shot him, in the back, as he swam. The bullet didn’t kill him. But it allowed him to drown. And then she walked back into the house to wait for Mr. French to come back from the plant. Since that took hours, she carved symbols into the wooden stock of the rifle, then hid it behind a loose wallboard downstairs. I took the rifle out and examined it. I was thinking that maybe the symbols were a hieroglyphic tale or pictogram: Mother Chases, Boy Runs, She Shoots. But I couldn’t make sense of it. I brought the rifle upstairs and sat down across from my brother at the kitchen table. My brother looked up from his sandwich, his small blue eyes remarkably piggish and wise. He had forgotten his earlier upset and seemed calm. I pressed the button that released the clip and looked inside. “How many?” my brother asked. I held up two fingers. He nodded. ​He and I stepped outside, into the backyard, and sat down against the crabapple tree, in its jagged shade. We stretched our legs out, our nearly identical legs, mine longer, but both pale and citified. Another ship began to pass us by with a huge roaring clank, viciously parting the river. This time, high up on its wheelhouse, I saw a small figure. It waved to us and I waved back, and then I rested the rifle over my forearm and pulled the trigger without looking. Joseph Cummins was born in Detroit and graduated Columbia University with an MFA in Creative Writing. He has published short fiction in The Carolina Quarterly, The Michigan Quarterly, Sleet, The View From Here, The Blue Lake Review, and Local Knowledge 3. His novel, The Snow Train, was published by Akashic Books. He is also the author of numerous nonfiction titles, most recently Anything for a Vote, a history of dirty tricks in U.S. presidential election campaigns. 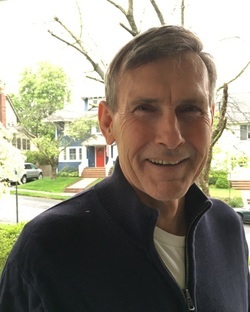 He lives with his wife and daughter in Maplewood, New Jersey, and teaches English composition at Hudson County Community College in Jersey City.